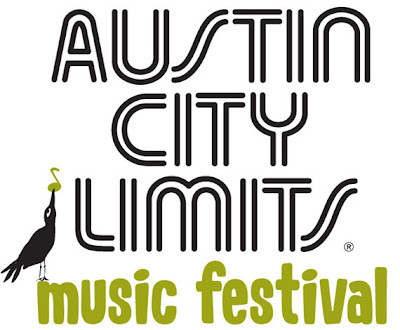 I posted last week about how Sparkles and I will attend Austin City Limits Music Festival (ACL) this Saturday and our ten-point plan for fun. Today I’ll share my five-point plan for Friday, when I’ll go without my kids. If you are a parent, you might be thinking that ACL isn’t for you, with ACL’s three long days of music and the $200 price tag. If you add the cost of food and a babysitter, you might need to dip into the kids’ college fund to pay for it all. But for me, as a Mom with small kids, ACL has been a great resource. I don’t get to see live music as much as I did before kids. I miss being there and I miss live music as a way to learn about new bands. With ACL, it’s as if all the music managers of the world got together and said, OK, Mom, this is for you – a ton of bands of all different genres on one day in the same place with good food and decent weather (well, since the festival moved to October). For a few years when my girls were really little, the bands I saw at ACL were the bands I listened to all year long. And if you go for only one day, and make a trade of some kind for babysitting, it is a pretty good value. Live Music is different when you are a Mom, most things are. Here is how I’m going to do it when I go this Friday. Maybe these ideas will help, if you are going too. 1. Pack and Dress Well. I’ll pack pretty much the same as I will when I go with kids, a small backpack with sunscreen, an unopened water bottle (unopened is a festival rule), wipes, camera, wallet (you need cash for many vendors), a cell phone and a blanket. (Yes, I’ll bring wipes, even though I won’t have my kids. They are pretty handy.) I’ll wear a hat and comfortable shoes. I’ll tell you sometime about my first ACL and how I wore cute sandals that didn’t hold up to multiple treks across the 46 acre park and landed me in the first aid station for band aids and how that was a little embarrassing. 2. Make a Tiny Schedule. The schedule can be overwhelming. For one thing, there are more than 125 bands. For another, I don’t know who these people are. It’s not hard to learn about them, you can play songs and get bios quickly on the ACL Schedule or Lineup pages and you can listen to Texas Music Matters’ ACL preview show. But, sometimes I’m walking around my house and I see the cat has thrown up and I think, “I don’t have time to clean that right now” and I really don’t. On most days, I don’t have hours to pour over data and evaluate exactly the right personal schedule to optimize my potential listening pleasure. So I’m not going to do it. I’ll look ask around and do a Facebook post and maybe read a little. I’ll end up with a few bands I want to see, then in-between I’ll see what someone else wants to see or walk around and stop when something sounds good. Sometimes shade influences me, the BMI and Zilker stages have the best shade. 3. Get Connected. I’ve had bad luck with my cell phone at ACL in the past, but I imagine by now the technology folks have made it possible for 75,000 people in one park to text all at the same time. I’ll use the Group Text iPhone app to make texting easier and the official ACL app for info and updates. The festival map will include locations for wireless and charging stations. 4. Eat Something New. The ACL food vendors are local businesses and the menus range from the everyday hamburgers and pizza to the pretty unusual, like rabbit and rattlesnake sausage. The same way ACL is a good place to find new music, I like to find new restaurants too. I might try Judges’ Hill Restaurant’s Pulled Puerco Pibil Sandwiches w/ Jicama Coleslaw & House Made Pickles and Daily Juice’s Blueberry Lemonade. I know for sure I’m going to try Coolhaus‘ choose your cookie+choose your ice cream idea, probably with the Chocolate Chip Cookie and the Dirty Mint Chip Ice Cream. 5. See (and Maybe Buy) Art. I’m developing more of a feel for art, mostly through my kids (see AustinKidsDraw.com), but more for myself, a little bit at a time. The ACL art vendors are mostly affordable and cover many types of mostly accessible art including paintings, clothes, jewelry and accessories. Most of the vendors are Austin-based and the goods are more unique than you would find in a typical store. Please share or tweet this post if you found it fun or helpful! I’ll check-in with y’all next week and let you know how the two days went. Welcome to Austin’s Tiniest Kids’ calendar with just a few carefully selected activities during the coming week, usually hiking, music or art-related. Last week was all music and this week is all theater, after being inspired by The Sound of Music at Zilker Park, which is also an option, through August 11. If you try that, check out these tips, I could have used them! But, before we get started, I’d like to introduce a new sponsor, Water Stone Aesthetics, a hair, skin care and cosmetics salon. Check out their new ad on the right. The salon is a blend of chic and casual and get this, the have on-site babysitting. My hair is longer now than it has ever been, mostly because it has been hard to find a time when I’m not working and I don’t have at least one of the girls. I’m going to check out Water Stone this week! The Austin Summer Musical for Children (ASMC) allows 1500 kids each summer to experience live musical theater for free. Community volunteers share their free time to create a fully costumed and choreographed musical for kids ages 3-10. If the show inspires you, check their web site for information about their Gala and Silent Auction on August 10. Check out a world premiere production in a 19th Century Opera House that is kid friendly! Director Susan Gayle Todd, of “The Three Little Pigs” rock musical fame, presents an innovative take on the Jack and the Beanstalk classic kids’ tale. This performance is a real life adventure, being Shakespeare for one and being performed in an outdoor theater in August for another. This makes it a better for the older kids. The University of Texas’ English department has produced this play since 1970 with English students taking a summer Shakespeare class. The energy and the joy of the students shines through and makes it a special night. Because I can. Because all is well. Because I have worked hard enough. That is what brought me to the Los Angeles County Museum of Art (LACMA) last week. I felt like Wang Lung in The Good Earth, when he recognized that he had worked hard enough on the land so he didn’t have to worry anymore about feeding his family. He could do something just because he wanted to and no practical reason was required. For Wang Lung, this meant buying his favorite prostitute and setting her up in his house alongside his wife. Well, that option didn’t seem like it would work, but I like art. Art feels like mankind collectively rejoicing in being and doing something more than we need to survive. And it felt like fate that my company’s office in LA, where I was working for a few days, was very close to LACMA. Day-to-day life has been harder lately. My new day job is full-time in the office instead of part-time at home. It takes more energy to get work done, in a new industry with new people and new challenges. At home, we have been eating out a lot lately. Blue Eyes and I have spent entire weekend days on laundry and groceries and picking up the one-hundred-and-fifty things on the floor. Don’t even get me started on the flies coming out of the drain or the cat that pees on the carpet. Blue Eyes will tell you that I’m a little more on edge than usual. On Thursday, my work day started at 5:30 AM Austin time and ended at 10:30pm LA time (add 2 hours for the time difference). That was followed by another 5:30am morning to get ready for an important meeting. After the meeting, later in the afternoon, I realized that I had worked hard enough and I didn’t have to worry anymore. I could do something just because I wanted to and no practical reason was required. I left the office at 4pm and went to LACMA. 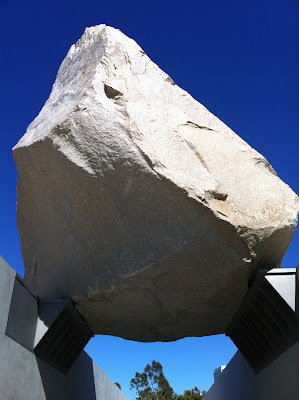 The picture above is of Michael Heizer’s Elivated Mass, a new installation that is grand and dramatic. Play the video below (I’m sorry I forgot the title and artist’s name!) to see a smaller, lighter and more interactive piece. I love that it is what it is, but it is also the movement and sounds from the kids swinging their arms and giggling with delight. If you have worked hard enough too, let us collectively rejoice.